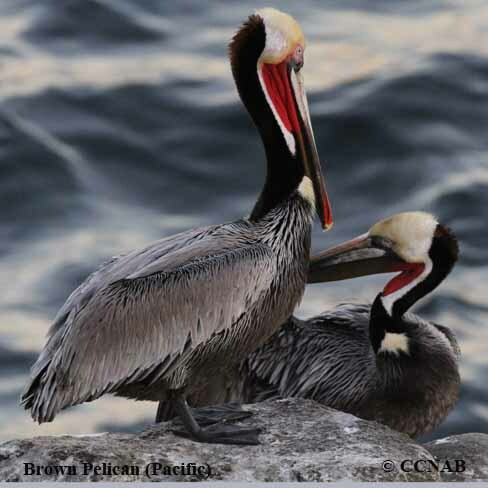 There are two sub-species of the Brown Pelican. One is the Brown Pelican (Pacific) and as the name indicates is found along the western coast of the states bordering the Pacific Ocean. This pelican is considered threatened and is in a state of recovery. The other is the Brown Pelican (Atlantic), the more common of the two. It is found along the Atlantic coastlines and into the Gulf of Mexico. It can also be found throughout the Caribbean islands. The Brown Pelican is one the largest seabirds found in North America. Although, they may seem awkward when observed on land, the pelicans can soar without effort. Recognized by their head-on dives straight into the sea to capture fish and using their large lower bills to hold their prey. When traveling along the coast, it is common to see them perched on street lights and piers.